I am very, very excited to introduce today’s guest and share her new release. Several months ago, I decided to put together a group of authors from various countries to collaborate on a novella series, with each story set in a different country. 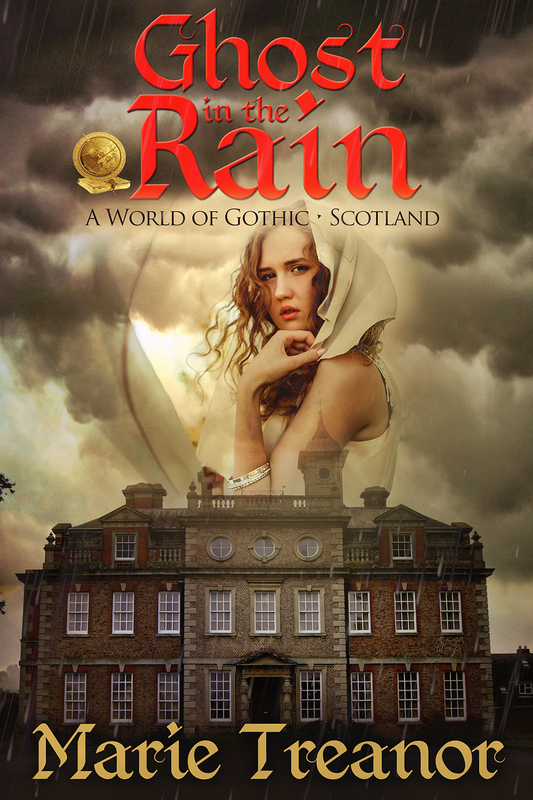 I love gothic mystery romances, so I decided that would be a fun genre for our series. I put out a few feelers, and Marie was one of the authors who came on board. Marie is the launch author for our series of stand-alone novellas. Her story, Ghost in the Rain, released today, and it is awesome!!! And, guess what? It’s on sale for only 99 cents! What did you like about writing as a group effort? I really liked the way ideas bounced around – how one author’s suggestion would set me thinking and spark another notion. Besides which, writing is a very solitary profession and it’s a lovely change to be part of a project that still lets you follow your own story. What was the most difficult part of writing as a group effort? To be honest, I don’t think I found any of it very difficult! I suppose I was very aware that if my story didn’t work, I would be letting the whole group down. I couldn’t just slide the manuscript under the bed and forget about it. So I worried that it wasn’t right for the series. But then again, the nice thing about a group effort is that other authors are there to give their opinion, and I was very glad this group’s was favourable! Thank you for joining me today, Marie. It has been a pleasure getting to know you and working with you on our series! Marie is giving away a FREE copy of Ghost in the Rain to once lucky commenter…a name will be drawn on Sunday. Marie is the award winning author of over forty steamy paranormal romances – Indie, New York and E-published. Enjoyed the excerpt! Having been stationed in Holland, South and across the channel from Scotland, I remember the dark clouds racing above those often storm tossed seas. Thanks for bring back memories of those days. You’re welcome! And yes, it can be a choppy crossing! And in celebration, it’s a filthy day today – black clouds and rising wind! 🙂 Thanks for the kind words! Loved the excerpt and the cover. Both look and feel very atmospheric! All the best with the release. Thanks, Nicole, that’s lovely to hear! Congratulations, Marie! I’ve been waiting for this one and can’t wait to devour it! Here’s to much success! Thanks for sharing, Alicia! Oh thank you, Maria! Hope you enjoy it 🙂 Eagerly awaiting yours, too! Thanks so much for having me on your blog today, Alicia! I feel very honoured to be the launch author for this fabulous series and look forward to EVEN MORE fun in the coming months as the other novellas are released 🙂 Waving hello to Alicia’s readers! Ohhhh–this sounds yummy and right down my little ol’ Southern Gothic alley. Scotland makes for an exotic setting and Dan wounds marvelously creepy. Best wishes for success. 🙂 Thank you! Love that you find Scotland exotic – your South would be more exotic to me – I suppose we’re too familiar with home :). Love your cover and the book sounds wonderful. Your cover is fabulous, Marie! I’m so delighted your book has launched. I’ve always loved Gothics, and your story kept me turning pages long after I should have gone to bed. It’s a real winner. Wishing you lots of success! Wow! What an excerpt! And the cover is fabulous. This story combines two of my favorite elements – rock stars and mysteries. Yum! Best wishes on this newest book release! Yes? A lot of Highlanders left, emigrated for one reason or another. Hope you make it here one day soon! Great cover. Great excerpt. Can’t wait to read. Best of luck with your new release. Ghosts! Oh, gosh. That was eerie. Loved the excerpt. Good luck to you. 🙂 Thank you, Kara! Glad you liked it. Love this concept and this story idea! Scotland seems like a magical place to me. I’d love to visit some day. Wishing you much success with the book! Thanks, Leah! Some bits are certainly more magical than others 🙂 Hope you make it over here one day soon! That cover IS stunning! And I love the idea of a rock star and a ghost. Not your usual setup! And Scotland intrigues me because of the whole Outlander thing. Got my copy! Thanks for sharing. And best wishes for the entire series!